Arginine Alpha-Ketoglutarate is suitable for bodybuilders, athletes and regular gym users wanting to gain muscle size and strength, get a better muscle "pump" while working out. 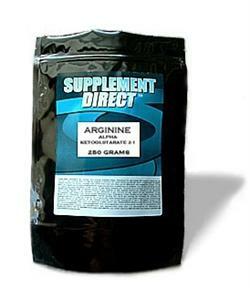 Arginine Alpha-Ketoglutarate acts to stimulate the production of nitric oxide in your body. Nitric oxide acts as your body's master "cell-signalling" molecule, directing and ordering a complex array of activities. It regulates blood flow, muscle contraction, nerve signalling and muscle growth, to name just a few. The functions of this molecule are very impressive. However, you can't just go out and buy nitric oxide. Instead, you use Arginine Alpha-Ketoglutarate, which is a natural, non-drug method of creating NO in the human body. Arginine has been shown to increase NO production in blood vessels, where it widens their diameter, increasing blood flow without elevating blood pressure. Not A Significant Source Of Any Vitamins.